The latest brain research confirms what Kindermusik has known for 25 years: cognitive and language, social and emotional, as well as physical development all begin in a child's very first days of life. Kindermusik Village™ stimulates your baby's growth through purposeful, engaging musical activities while celebrating and nurturing the remarkable bond you share. The first 18 months of a child's life are a time of nonstop wonder and discovery. It can also be an exhausting time for parents. One tried-and-true remedy for fatigue and the Baby Blues is to "get out of the house" and rejoin the community. Not only is this class an incredible bonding experience for you and your child, but it's also a great way to meet other parents and find future playmates for your little one! Please wear comfortable clothing and be prepared to move! Bring your baby to Kindermusik Village and you'll both be in for a treat! An incredible bonding and learning experience awaits as you explore creative movement, singing, dancing, rocking,baby exercise, intentional touch, vocal play, and object and instrument exploration. We'll have a great time exploring scarves, sticks, bells, balls, puppets, my big colorful parachute and more! 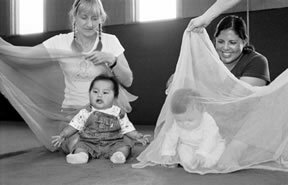 Parent education is a big part of the program as you will learn how many of the class activities affect baby’s development. You do not have to know how to sing to take this class. 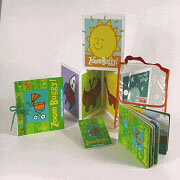 The home CD allows you to listen to the music at home and repeat the activities learned in class. Baby will love listening to the music and hearing you sing the songs. Use the lullabies for night time rituals and play the CDs in the car or anytime you want to calm Baby.  Home journal which includes the words and music to many of the songs.